Mordian 7th Regiment: Heresy Era Imperial Army - Geno Five-Two Command and Recon squad painting (almost) complete! 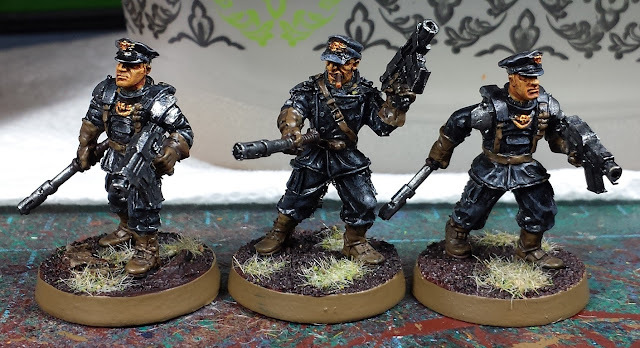 Heresy Era Imperial Army - Geno Five-Two Command and Recon squad painting (almost) complete! Leading things off is Hetman Peto Soneka (generously donated to the cause by the always-awesome Dai of The Lost and the Damned and the Stunted) and his command squad with a Voxcaster and (what will eventually be) the Company standard. The other three members of the squad are armed with Heavy Stubbers, which I've always liked as a support weapon. Next up is the recon squad, all armed with sniper rifles. Tried to come up with a camo pattern that matched the bases for the cameoline cloaks, and decided to go with yellow interior lining to tie them in with the rest of the force. They performed admirably on the table recently, as well - very nearly taking down a Bloodthirster all by themselves! Lastly are the Gene-whips, Franco Boone and his prods Roke and Pharon - with the leadership of the auxilia lists being on the low side, the addition of the proto-commissars is a welcome addition! Love the proper Old School Imperial Guard Officer in the command squad, nice. Lovely stuff. The Gene-Whips are great> Love the mix of parts that you've used across this lot. Love 'em. Not sure about the wallpaper in the background however. @Siph_Horridus: Indeed - felt the old-school mini was just the thing! @The GunGrave: I appreciate the kind words! @Monkeychucka: Hah! In the grin darkness, there's a little paisley! Good work as ever my good sir. You always manage to tie and army together rather well. Looking forward to seeing how they stand alongside your Alpha Legion. The Hetman looks ace! Was worried he'd look all out of place, but he seems to fit in well. The Gene-whips are super cool and stun batons are what the Geno would require to keep their troops in order! Ah, my new favorite weapon, the Power Maul. Loving the way this army is coming together. These are spectacular. They hit every right note.